As some of you are aware, we had difficulty with our host server on March 31. We are so sorry for the inconvenience this has caused. 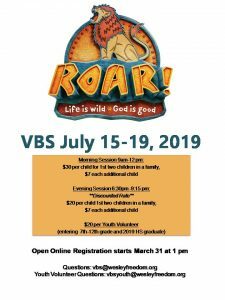 If you emailed or called Cyndi Gordon on 3/31 regarding registration and have not yet heard back from her, please email her at vbs@wesleyfreedom.org. At this time, AM Preschool, AM Elementary, AM Youth and PM Youth are filled. Please fill out the waitlist form. Please set your browser to Google Chrome and click the appropriate link below to register your child.